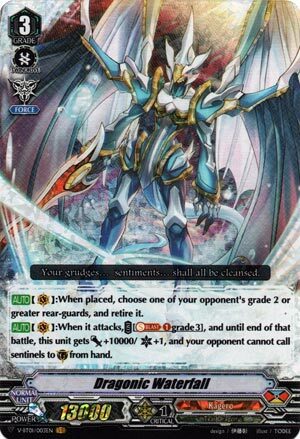 [AUTO](VC):When placed, choose one of your opponent’s grade 2 or greater rear-guards, and retire it. [AUTO](VC):When it attacks, COST [Soul Blast (1) grade 3], and until end of that battle, this unit gets [Power]+10000/[Critical]+1, and your opponent cannot call sentinels to (GC) from hand. Right, so this has the same problem as Imperial Daughter in that he’s lousy as far as sitting on him as a vanguard goes. You get the Force Gift and a -1 to the opponent but that’s about it. However, unlike Imperial Daughter, this actually CAN end games should you obtain another Waterfall, since this will seal any Sentinel by Soulblasting a Grade 3, and if you stacked both Gifts on his Vanguard circle, Waterfall is swinging for 43k unboosted, not even taking into account boosters like Raopia, Aermo or even ruddy Gojo. The obvious game-ender for Standard Kagero, which sadly means it’s a 4-of staple. Enjoy your lack of money. What’s up, Rogue Squad?! To wrap up this week of VR’s, let’s look at the card that’s leading the Standard Format: Dragonic Waterfall. See, Waterfall has so much good working for him in Standard that it’s borderline unfair to the other clans. The reason I say that is because this is the only Force card at the time of this review that has a guard restriction, and it’s a good one considering that Waterfall also gets +10k and a Crit. The 10k isn’t as threatening nowadays, since most shields can compensate the buff, but the Crit and the restrict is the important part, and that +10k becomes more and more daunting for each Force Marker on its circle, and since you need to Soulblast a Grade 3 for the cost, then that means that there should already be at least 2 Force Markers on the Vanguard circle by the time you attack, meaning that you’re dealing with a minimum 43k, Crit 2 with Sentinel restriction…unboosted…welp…time to prepare for a dragon Meta for a small while. Next Time: More cards from V Set 1.